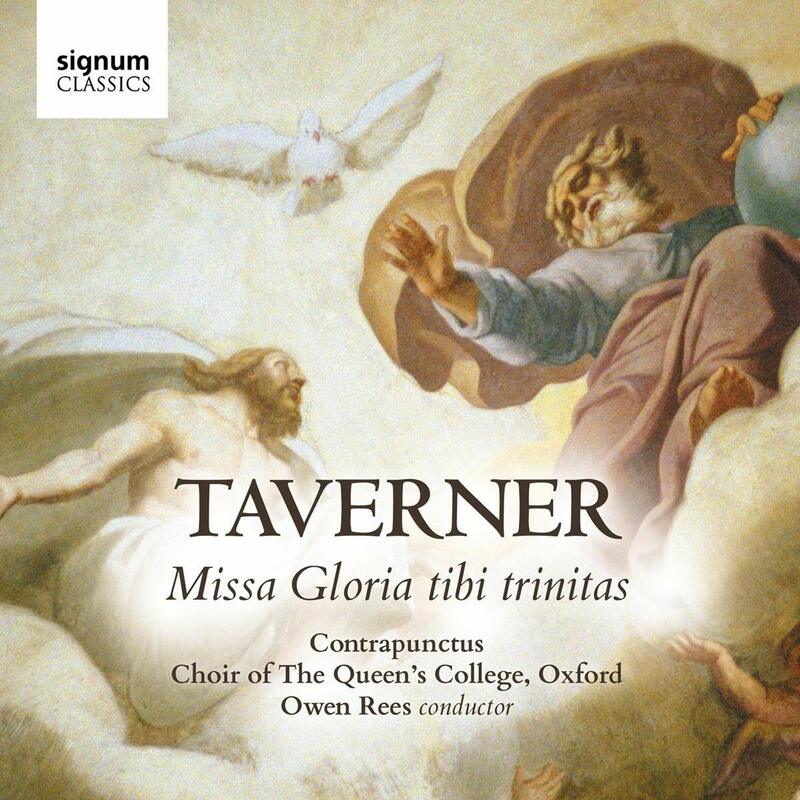 For this thrilling new recording of John Taverner's Missa Gloria tibi trinitas, on Signum Classics, Owen Rees conducts the combined forces of Contrapunctus and the Choir of The Queen's College, Oxford. The programme also includes Taverner's Gaude plurimum, Le roy Kyrie, Ave Maria, Audivi vocem and Dum transisset Sabbatum. 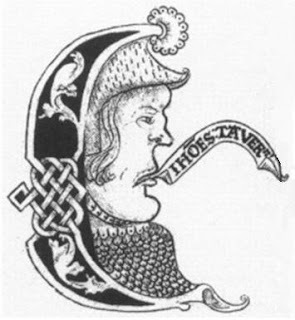 We don't know much about the circumstances of Missa Gloria tibi trinitas' composition, it could convincingly date from Taverner's period in the collegiate church in Tattershall, Lincolnshire, or from his time at Cardinal Wolsey's Cardinal College in Oxford. The mass survives in the Forrest-Heyther part-books in the Bodleian Library which may have come from Cardinal College or the Chapel Royal. Owen Rees suggests that for a major performance of the mass on Trinity Sunday in Cardinal Wolsey's chapel or in one of the palace chapels the full forces of the choir would have numbered some 30 to 40 singers. Far larger numbers than the majority of performances on disc. Taverner's mass contrasts sections for full six-part choir with long sections for two or three voices, and we know from contemporary records that these reduced scoring sections would usually have been taken by solo voices, and in fact the rather virtuoso vocal writing bears this out. For this recording Rees has around 40 singers at his disposal and key to the performance is the thrilling contrast between the single voices of Contrapunctus and the full combined ensemble of Contrapunctus and the Choir of The Queen's College, Oxford. The result is to give a real sense of drama to the changes in scale in the music, something that can be missing with smaller ensembles. capital E in the Forrest-Heyther partbooks. The professional singers of Contrapunctus give powerfully focused and finely controlled accounts of the reduced scoring passages, showing a great combination of accuracy and vibrancy, making the music discreetly bravura. And the larger ensemble follows them; despite the number of singers and the lively acoustic of the Church of St Michael and All Angels, Oxford the result is a performance notable for its vibrant dynamism yet with a clarity too. And hearing the contrast between just three voices and the full 40 in full flow is thrilling. Contrapunctus contributes a pair of smaller items, the Le roy Kyrie and Ave Maria, whilst the full ensemble brings the same dynamic changes of scale to the motet Gaude plurimum, and the responds Audivi vocem and Dum transisset sabbatum. These latter two represent two different styles, with the first using chant and just four upper voices for the verses (a quite magical texture), evidently this was the standard way with a respond at the time, whilst the latter uses full choral forces and this choral respond seems to be something that Taverner masterminded. It might seem strange to call a performance of an early Tudor polyphonic mass thrilling, but this performance certainly is without ever losing and of the sophistication and control necessary for this music. The idea of hearing this type of performance live is quite dramatic, and this recording which really captures a moment, the idea of Henry VIII or Wolsey listening to the full forces of their crack choir in this glorious music.